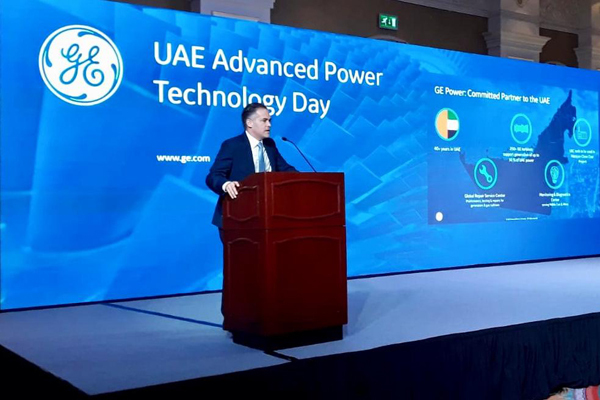 GE Power, a leading technology company, recently showcased a suite of innovative technologies shaping the future of the energy sector, at the ‘UAE Advanced Power Technology Day’ organised in collaboration with the US Embassy in Abu Dhabi, UAE. The solutions presented complement the direction under UAE Energy Strategy 2050 to increase the contribution of clean energy to the total energy mix from 25 per cent to 50 per cent and reduce the carbon footprint of power generation by 70 per cent, thus saving Dh700 billion ($190.57 billion) by 2050, said a statement. The event welcomed up to 70 high level attendees, including government officials, industry experts, power plant owners and operators, consultants, and others, it said. Taking centre stage at the event were GE’s record-setting HA technology – the world’s most efficient heavy-duty gas turbine; and the Advanced Gas Path (AGP) upgrade technology, which helps deliver higher levels of efficiency, output, and flexibility while lowering maintenance costs for customers, allowing them to better utilize existing assets. “UAE Advanced Power Technology Day underlines GE’s commitment to support the country in reducing the environmental impact of the power sector, with proven, cost-effective solutions that pay for themselves,” he added. An excellent fit for the UAE’s evolving energy landscape, GE’s HA technology offers more than 64 per cent efficiency in combined cycle power plants – higher than any other competing technology today. The turbine has already helped to deliver two world records for efficiency, one each in the 60 hertz and 50 hertz segments of the global power market. Capable of ramping up or down at up to 88 megawatts per minute while still meeting emissions requirements, the turbine can help support countries transitioning to a larger proportion of renewable power in their energy mix by helping to balance grid instability. GE was the first to launch H-class gas turbine technology in 2003 and its evolution led to the introduction of the HA turbine in 2014. In the UAE, the HA technology is being adopted by the Sharjah Electricity and Water Authority (SEWA) for an upcoming 1.8 gigawatts independent combined cycle power project located in Hamriyah, Sharjah. GE’s AGP technology has been installed on 450 units, generating $775 million a year in benefits to power producers and the markets they serve in 39 countries on five continents. With AGP upgrades, GE 9F gas turbines can achieve up to an 8 percent output increase and up to a 2 per cent efficiency increase, whereas GE 6F gas turbines can realize up to a 4.2 per cent output increase and up to a 1.2 per cent efficiency increase. GE 9E gas turbine operations with AGP upgrades have achieved up to a 6.2 per cent output increase and up to a 1.7 per cent efficiency increase. These turbines are widely deployed in the Middle East and the AGP solution is being implemented across the region to enhance gas turbine performance outcomes. “I am pleased that GE is answering that challenge by providing our Emirati partners with solutions to help the UAE achieve its ambitious targets. GE continues to demonstrate why it is a global business leader and has been a committed partner to the UAE for more than 40 years,” he added. Other technologies in focus at the event included integrated solar solutions, modular battery energy storage solutions, smarter, cleaner steam power technologies, and digital applications for better asset management and dispatch planning. “Our company is proud to be a part of the country’s innovation journey by bringing advanced, record-setting solutions to the UAE, and we remain committed to helping to diversify the energy mix, modernise the power sector and meet national energy security goals,” Al Muthanna added. GE has supported the development of the energy sector in the UAE and the wider Gulf Cooperation Council (GCC) for over 80 years.